>>Bay Area cities earmark $1bn to be EV capital of U.S.
A few weeks ago I spent some time with a group of road-building contractors from Pennsylvania, and I took the opportunity to ask what sort of infrastructure changes they’re planning for in an oil-constrained future. The answer, in two words, is truck lanes. 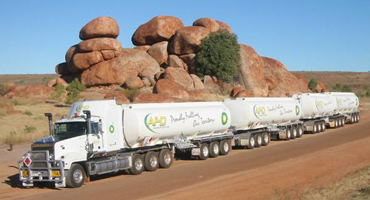 Confronted with $4 diesel fuel, headed to $10, trucking companies want permission to run road trains. A road train is a string of several trailers pulled by a single tractor cab. This is common practice across the Australian Outback, and it’s common to see trailers double-ganged or occasionally tripled on open stretches of highway in the western United States and Canada. Trains don’t mix well with congested traffic and windy roads – car drivers especially object to the problem of passing a slow road train grinding up a long grade. North American rules limit road trains to about 100 feet in length, and to limited-access highways with at least two lanes in each direction. To pull trains of four or more trailers, truckers would need dedicated lanes, and big trucking companies are beginning to say they’d be willing to pay for their construction and maintenance via tolls or special taxes. 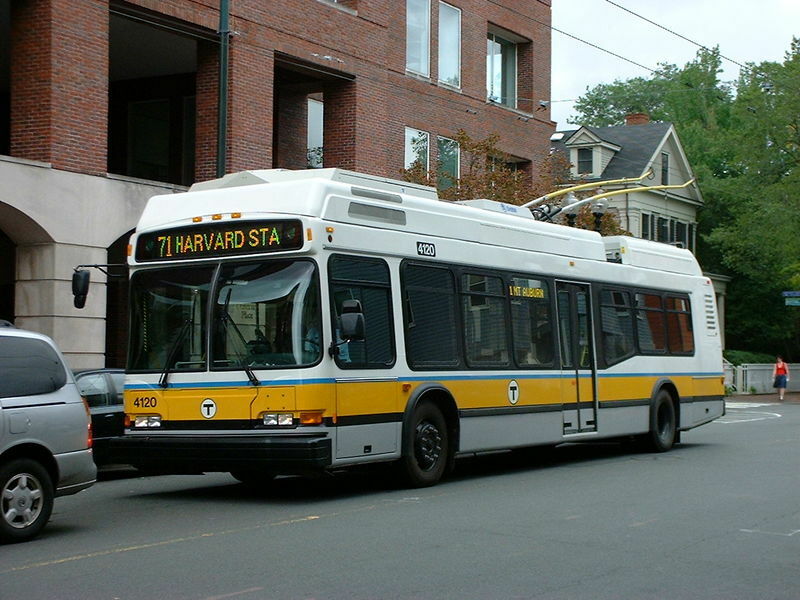 Most of us have by now ridden in, or seen, the new generation of “hybrid” buses. These are diesel-electric machines, manufactured by a dozen companies around the world, including (in North America) General Motors, Gillig, Motor Coach Industries, New Flyer, North American Bus Industries, and Nova. This is now conventional, mainstream, off-the-shelf technology. Mitsubishi, Daimler-Chrysler, and International Harvester have already introduced mid-size diesel-electric trucks. Semi-trailer tractors are right around the corner. Once a heavy over-the-road vehicle is loaded up with batteries and running in its own dedicated lane, it makes sense to recharge the batteries while rolling. This can be done by pulling current from an overhead wire. In fact, it makes sense to string high-voltage catenary wires wherever the road runs uphill, so trucks can run at full electric power (and at full speed) up long grades. In this mode, trucks would run just like trolley buses, a technology that dates back to 1890. The more miles of wires are strung, the more miles the trucks will cover powered entirely by electricity. It’s conceivable that a truck could move a mile across the flat on a kilowatt-hour of power – roughly for 11 cents at today’s rates. That sure beats paying a buck a mile (or ten bucks, someday) for diesel, and the difference would pay for a lot of infrastructure. If a couple of wheels on each trailer have their own hub motors, then running on grid power doesn’t even put an extra load on the tractor, which simply commands steering, power management and braking functions. For maximum traffic density out on the road, speed control and spacing – even steering on some stretches of road – can be turned over to remote computer control. Arriving at a destination city, a road train would have to pull into a “switching yard” and distribute its trailers for single-unit delivery on surface streets, pulled by local cabs. This system can be developed incrementally, and will lead to a huge improvement in cargo-moving efficiency. The irony is that it requires no new technology. All the major mechanisms, from diesel-and-electric drives to logistical procedures, were invented and deployed a century ago by the New York Central, New Haven and Pennsylvania Railroads, simply to handle the problems of running dual-powered locomotives through tunnels into Manhattan. In effect, the trucking industry is going to replicate the railroads. Without the rails. Once trucks start running on cheap electric power (and we hope it will be from carbon-free sources), drivers of EV and PHEV cars are going to want to hook up to their own highway catenaries. And that will represent a real revolution in clean personal transport. Excellent article. I like your use of metaphors and iambic pentameter. Though next time I was thinking something more along the lines of a haiku.